You may think of property taxes only when you get your property tax bill in November, with your taxes due by year end. But in November and December, you’re generally too late to do anything but pay the taxes. In Missouri, in odd numbered years, county assessors are required to send notices of changes in assessed value or changes in classification. If the revaluation or reclassification (from agricultural to commercial for example) seems wrong, a property owner may appeal to the board of equalization before the second Monday in July. If you’re in Jackson County, the City of St. Louis or St. Louis County, or other first-class, charter counties, you may be subject to variations on the general discussion of the rules contained here. If you need help, you should see a local lawyer who handles tax appeals. Units of government (such as counties, school districts, fire protection and ambulance districts) adopt levies. Levies are rates. These levies, multiplied by the assessed valuation, will generate enough tax revenue to allow the governmental units to meet their budgeted obligations, such as debt service on bonds and operating expenses. 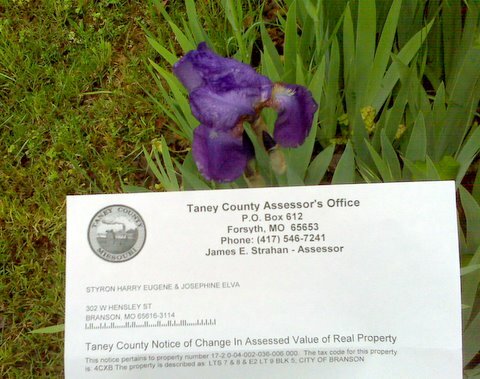 County assessors are required by law to put a value of each parcel of real property in odd-numbered years. The tax statutes call this amount the “true value in money,” a term that is roughly equivalent to fair market value. The true value in money is not the assessed value. To reach the assessed value, the true value in money is multiplied by the statutory assessment ratio, which is 12% for agricultural or horticultural property, 19% for residential property and 32% for commercial property. An assessor may not increase the assessed valuation of a residential property by more than 15% (assuming there has been no new construction on the property) without making a physical inspection of the residential property. Of course, an assessor may decide to increase by 15% or more without actually making the inspection, and many property owners won’t appeal to the board of equalization. Most counties in Missouri do not require disclosure to the county assessor of the sales price when real estate is sold. As a result, assessors (and private real estate appraisers) use whatever kinds of statistics that they can gather to estimate trends in values, though some persons willingly disclose the amount paid or received. In this declining market, revaluations may be based on statistics generated during the stronger market of a year or two ago. An attorney is not strictly required for an appeal of a revaluation or reclassification; you may try it on your own or with the assistance of an appraiser or other professional who takes on such challenges. If the resulting change in tax is only a few hundred dollars, the increased taxes may be smaller than the attorney fee. The attorney may also require that you pay for an appraisal. You should remember, though, that the revaluation has a life of two years and may be used as a floor for a future increase. Some lawyers and others will handle an appeal to the board of equalization, with their fee based on the tax savings. This type of contingency fee arrangement is not common for appeals relating to single-family residences, though it is common for commercial and industrial properties. We tend to be wary of redistribution of wealth, especially when it is accomplished by changes in income tax rates. We may not feel that the existing distribution is fair, but we’re very sure than any change that makes us pay more is damnable. Changes in assessed valuation are a very real mechanism by which redistribution may be accomplished, and you can often undo at least some of it by appealing. I lived in another state where the Republican county assessor lagged in revaluation of portions of the county that contained primarily Republican voters, which may have helped her reelection bids as well as building a base of support for her attempts at higher office. When I chanced upon her name in a list of Branson condominium unit owners a few years later, I thought it was funny that she might be getting a taste of her own medicine, where the assessor’s bias (if any) might be directed toward absentee owners who don’t vote locally. Revaluation of commercial property may or may not receive aggressive treatment in reassessment, depending on the local political geography. If the owners of much commercial property are not local voters, the assessor may not receive much criticism for overvaluing commercial property relative to other property classes. When we are successful in challenging an increase in valuation, we shift a small amount of the tax burden to owners of other parcels. We’re not actually taking money from schools. However, if the aggregate property tax revenues are not sufficient to meet the lawful needs of the property tax-dependent units of government, then the levies can be adjusted without a vote of the taxpayers, so that voter-approved debts are paid. Otherwise, school districts wouldn’t be able to borrow money as inexpensively. In furthering our personal self-interest by minimizing our property tax liability, we sometimes are irrational, and elected officials bear the brunt of our expressions of resentment. The tax assessor does not impose taxes, but merely plays a part in establishing the valuations on which they are based. Don’t unload on the assessor; appeal to the board of equalization instead. The county collector does not impose taxes, but collects taxes imposed by others. If you think something is really wrong with your tax bill, you still must pay it on time, preserving your rights (if any) by paying under protest. You should consult a lawyer about how to to pay under protest. In reality, voters impose property taxes on themselves, but are able to partially shift sales taxes to others who shop locally but live elsewhere. But then they go elsewhere and pay sales taxes there. And we have to pay voter-approved property taxes where we live, regardless of how we voted. Property taxes are just a small part of our direct tax burden. My own real property and personal property taxes may total $2,000 per year, while my income tax is several times as much. If I spend $30,000 a year on items subject to sales tax, I spend as much on sales tax as I spend for property taxes. Some taxes are voluntary. Taxes on amusements, alcoholic beverages and tobacco are also substantial for some people. A lottery ticket is all tax except in rare instances, and some people who hate to pay taxes don’t mind buying lottery tickets, and some people who pay little other tax also like to purchase lottery tickets, alcohol and tobacco. Changing the tax system to make it more fair is a huge job. But appealing to the board of equalization to challenge your revaluation is something that you and I can easily do. Posted in county government, Missouri, Missouri law, Ozarks economy, property tax, real estate law, Taney County and tagged Missouri board of equalization, Missouri county assessor, property tax, property tax appeal, revaluation. Bookmark the permalink. Hi Harry, Love the website but I miss the picture of the Taneycomo Bridge at the top 🙂 I am so glad you mentioned in this article about the step of “paying under protest” when you don’t feel your tax bill is correct. This would have been valuble info to me in December. I gotta go now and sort through the stack of tax reassessments that I got in the mail last week! First, if you want to challenge the value placed on your property by the assessor, you have to do it by appealing to the board of equalization by the second Monday in July. Paying taxes under protest will not give you the right to challenge the value, but it may preserve your right to make another kind of challenge, such as for a computation error. Second, I’m glad you liked the photo of the Taneycomo bridge which used to be at the top of the page. I have taken some other photos of that bridge and will use them in the future. The current photo is also Taneycomo, at Branson Landing, with the silhouette of the Bass Pro Shops store against the sunset. I took it with my phone while rowing my boat a few weeks ago. Everyone should be doing this as property values have taken a dive everywhere. Good info. Property values have dropped pretty much everywhere, and in some locales the size of the drop has not been the same for commercial, industrial, agricultural and residential property of various types. Because the assessment ratio is higher for commercial and industrial uses, a small overassessment results in a relatively higher tax bill than the same amount of change in dollars for residential or agricultural.